Cell phone inventor Martin Cooper told us back in March that he had switched over from the i*hone to the Motorola Droid to get some experience with Android. While we were thrilled to see this news, we were quite surprised today when CNN ran an interview with Marty and he mentioned the Droid once again when asked about his current device. Yep, and really this phone is not a really complicated phone. It does have a phonebook in it, it does reach certain parts of the Web, but it’s not a PDA. You can’t read e-mail on it; it doesn’t have a camera on it. It really is a basic telephone. I also have a Droid. I got a Motorola Droid that I use. I also have a Jitterbug. I’m always trying whatever the latest telephone is. I had an iPhone for a while, I gave that to my grandson. Kids are really caught up in that. But I think that the Android phones are catching up now, and the latest version of the Android phones are every bit as good, if not better, than the iPhone. We love you Marty and are honored to see that we are one of the 4 people you still follow on Twitter. Feel free to follow him! 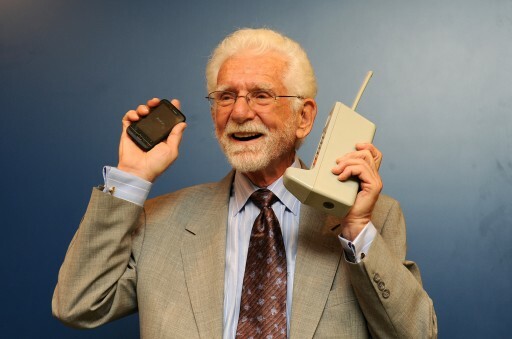 (@MartyMobile).